Remember when Trump reduced sanctions against Deripaska's company, Rusal, w/ McConnell's support? Kentucky might be going into business with the Russian mafia. If all goes according to plan, by the middle of the year, we’ll be in business with Oleg Deripaska, a buddy of Vladimir Putin. He could be sending $200 million — if you believe media reports — in what could very well be mobbed-up money to northeastern Kentucky to build a $1.7 billion aluminum plant on an old strip mine there. The United States government, according to the New York Times, has long believed that Deripaska has deep ties to Russian organized crime — the Bratva — so much so it has limited his travel here and prohibited him from doing business in this country. As Millennial Elites fall for fresh new faces like @PeteButtigieg their crushes will cool w scrutiny & in the face of formidable fund-raising by @SenSanders Watch now as he accumulates more centrists Democrats & raises a ton of money. He's doing this because Fox and Trump think Trump can beat Sanders. I don't believe John ever fathomed that he would die at 38. He didn't buy into things like The Kennedy Curse. Stuff like that made him hurl. But 20 years later, I do think he would want to be memorialized by the cast of characters who knew the real John — and helped him create the magazine he loved. Meet George. ELINORE CARMODY, PUBLISHER John and Michael's early way of putting it was they wanted George to be to politics what Rolling Stone was to music and what Sports Illustrated was to sports. MATT SAAL, SENIOR EDITOR The word he used a lot was "demystify." He would always push that in stories. The story ideas he got the most excited for were those that would raise the curtain a little on the process of politics. I had been out in New Mexico and I met this guy who was working in a coffee shop there and he loved George magazine; he was working part time and going to the university out there. When I told John he loved it, he just loved that someone who was really far from centers of power and influence and privilege and all that was learning about politics. And that, to him, was what the magazine was about. MICHAEL OATES PALMER, INTERN My first week on the job, he had a party at his loft for the staff. He invited the interns! Suddenly I'm having dinner at John Kennedy's house. It was like a buffet, super casual. Some of the staff climbed up to the roof to play Frisbee. Oh man. 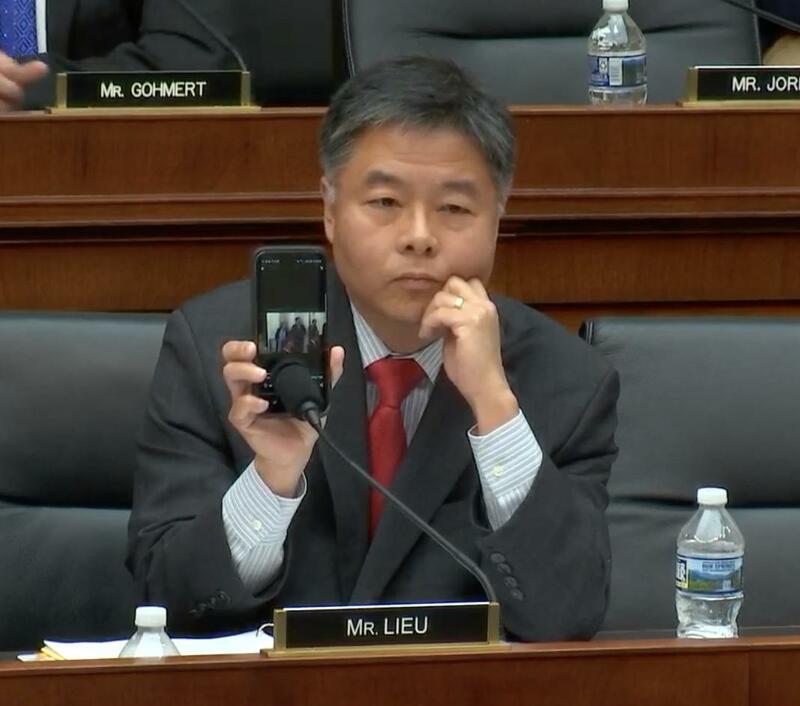 Rep. Ted Lieu now playing a tape of Candace Owens, who is sitting right there, saying it would have been fine if Hitler just wanted to make Germany great. Nadler interrupts with the gavel. "It is not proper to refer disparagingly to a member of the committee. The witness will not do that again. Owens: "Sure. Even though I was called despicable." I tried to see if I could confirm both the 700 page estimate of the length of the Mueller report and the 2 million page estimate of the volume of raw evidence that Judge Napolitano repeatedly offers in his comments here. "We'll decline to comment, thanks," Peter Carr says. “We saw on Sunday a four-page summary of a 700-page report,” the Fox analyst said. “The 700-page report is a summary of two million pages of documents, of raw evidence. MSNBC has confirmed that the report is several hundred pages long. They had a chryon up a short time ago. Experts say the anti-vaccine or vaccine choice groups, as they commonly refer to themselves, are becoming larger, better organized and funded in part because their prolific use of social media, as well as the rise of a group founded by Robert F. Kennedy Jr. which has helped to coordinate their efforts to push back on new laws. The call to action was co-signed by over 50 like-minded, mostly state-based groups. Activists who attended the Feb. 27 hearing on the recent measles outbreaks could be heard jeering loudly when both Dr. Nancy Messonnier, the director of the National Center for Immunization and Respiratory Diseases at the Centers for Disease Control and Prevention, and Dr. Anthony Fauci, director of the National Institute for Allergy and Infectious Diseases at the National Institutes of Health, stated the measles vaccine was safe and rarely caused complications like brain swelling. 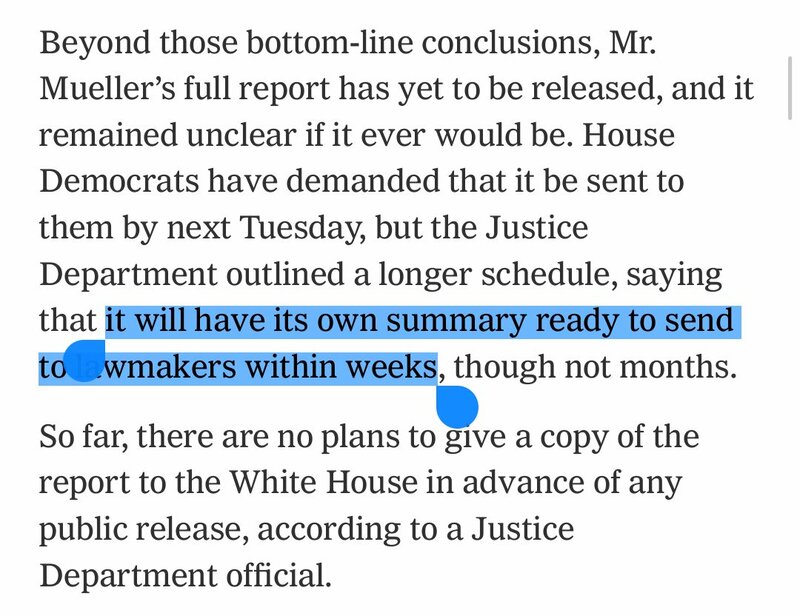 Barr won't be sending the actual report , he's writing another summary according to NYT. This says Barr isn't even going to send a redacted version of the full Mueller report. He's going to write a summary of the Mueller report, and send that instead. We don't even know how long the Mueller report is. Mueller's report has got to be bad. Why go to such lengths if it isn't? Unless the NYT just used bad wording.